I recently saw a “call for artist” on facebook via an artist Heidi Keyes with whom I facebook /follow. Heidi added a link on her wall to David Sandum Blog about the project he is working on as a Twitter Art Exhibit, my interest was raised as I am a avid tweeter @HazelRayfield. The idea is that artists contribute a postcard size original artwork /painting which will be then exhibited in Norway at the Moss Libraray and sold to raise money for the charity. 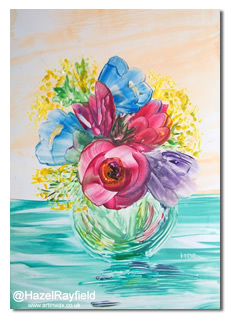 Since contacting David via email and twitter @DavidSandumArt I have now sent this painting “Spring Flower Vase” to Norway to be included into the exhibit. I painted this especially for the exhibit, it is similar to some recent paintings I created in larger sizes and felt it was bright and cheerful and therefore an appropriate piece for the exhibit. The exhibit opening will be on the 12th April 2012 opened by the Mayor of Moss. The wall with the paintings will have computers located nearby so viewers can tweet the artists live from the exhibit. Each painting being postcard size will have the artist’s name and twitter name printed along side it. Sarah Wiske @SarahWiskeArt is collecting photographic images of the art for a twitter video she will create for the project, thus bringing together the exhibit into the twitter world online also.